The Lord added daily to the Church those who would be saved. Salvation ... is in Christ Jesus. Neither is there salvation in any other. Basing itself on Holy Scripture and Tradition, this Sacred Council teaches that the Church now sojourning on earth as an exile is necessary for salvation. In explicit terms, Christ affirmed the necessity of Baptism and thereby also affirmed the necessity of the Church, for through Baptism as through a door men enter the Church. Christ, present to us in His Body, which is the Church, is the sole Mediator and the exclusive way of salvation. If anyone does not condemn those ... who hold opinions similar to heretics and who have remained in their godlessness up till death: let such a one be anathema. 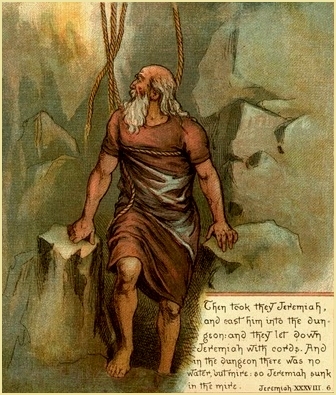 The devil has for his emissaries and assistants abandoned men, particularly heretics who, sitting in the chair of pestilence, scatter the deadly seeds of evil doctrines, thus unsettling and precipitating headlong those who cannot distinguish vice from virtue and are of themselves prone to evil ... Heretics, Jews, and infidels ... are continually employed in darkening the true faith by falsehood, and they are busy subverting all Christian piety ... Of all calumnies, the worst is directed against Catholic doctrine. Persons who extol the propagators of error and unsound doctrine are themselves guilty of the same crime. He who continues in this sin is destined for the unending punishments of Hell. No one who has arrived at the use of reason can be justified unless he is resolved to keep all God's commandments ... Against the First Commandment all those sin who do not have faith ... Such sinners are very numerous, for they include all who fall into heresy, all who reject what Holy Mother the Church proposes for our belief. Outside the Catholic Church no one is saved. There is but one universal Church of the faithful, outside which there is absolutely no salvation. No one can be saved outside the bosom and unity of the Catholic Church. Q. Why is it necessary to belong to the Church in order to be saved? A. Because salvation outside the Church is just as impossible as salvation without Christ. Q. How has Christ made known to us that there is no salvation outside the Church? A. By these words of the Gospel: "If he will not hear the Church, let him be to thee as the heathen and the publican"; "He who heareth you, heareth Me; and he who despiseth you, despiseth Me." Q. Who do not belong to the Church? A. Infidels, heretics, schismatics, excommunicates, and apostates do not belong to the Church. A. Infidels are such as have not received Baptism, such as Jews, Mohammedans, Brahmanists, Buddhists, and idolaters. A. Heretics are such as, although baptized, reject one or more articles of faith taught by the Church, such as Protestants. Q. 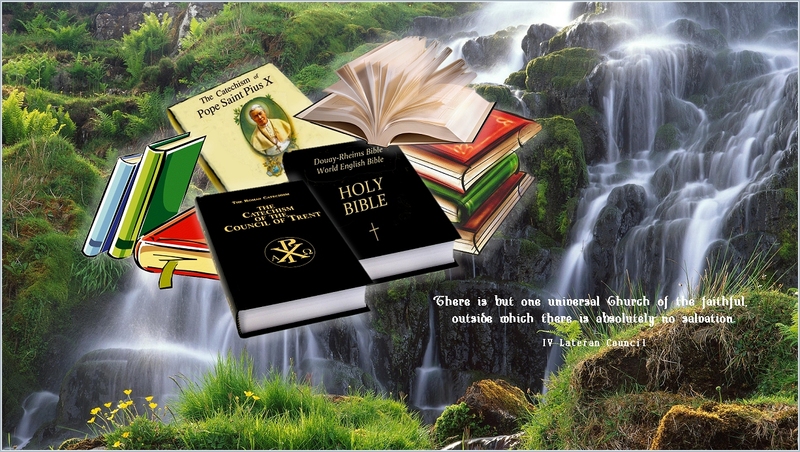 Why is it necessary to know which of these religious societies is the true Church of Christ? A. Because it is only in the true Church that men can work out their salvation. Q. What is the name of the society of faithful? A. The Church Militant, thus named because they are for- ever fighting. Q. Against whom does the Church fight without ceasing? A. Against demons and depraved men. Q. Who are these depraved men? A. Infidels, Jews, Heretics, Schismatics, Apostates, Excommunicates, and corrupt Christians. Q. Are all living men members of the Church? A. All of them are not, but they must become members. Q. Why must all men become members of the Church? A. So that they may reach Heaven. Q. Is it possible to be saved without belonging to the Roman Church? A. No, because the Roman Church is the only true Church, and outside the Church there is no salvation. Q. Is there any other true Church besides the Holy Catholic Church? A. No; as there is but one Lord, one Faith, one Baptism, one God and Father of all, there is but one true Church. Q. Are all obliged to be of the true Church? Q. What means: "The Church is Catholic"? A. "The Church is Catholic" means that she was founded for all men and is spread over the whole world. Q. Can anyone be saved out of the Church? A. Out of the Church no one can be saved, because she alone was founded by Christ to save men. Since there is no expiation, no purity, no integrity in him over whom the Divine Name has not been invoked, we desire and pray that all mankind may abandon the darkness of their impious infidelity and, enlightened by the rays of divine light, come to recognize the power of this Name and look to it alone for true sanctity; and that, thus receiving the Sacrament of Baptism in the name of the holy and undivided Trinity, they may receive the fullness of sanctity from ... God Himself ... But what we most particularly ask ... is that all may acknowledge and revere the Spouse of Jesus Christ, our Most Holy Mother the Church, in which alone is to be found the copious and inexhaustible fountain which cleanses and effaces all the stains of sin, and from which are drawn all the Sacraments of salvation and sanctification ... To that Church alone, and to those whom she embraces in her bosom and holds in her arms, appertains the invocation of that Divine Name, outside which there is no other name under Heaven given to men whereby we must be saved. Q. How is the Church Catholic or Universal? A. The Church is Catholic or Universal because she subsists in all ages, teaches all nations, and is the one Ark of Salvation for all. Why do we put these articles: The communion of Saints, The forgiveness of sins, and Life everlasting after: "I believe in the Holy Catholic Church"? Answer: In order to show that there is no holiness, no forgiveness of sins and, consequently, no salvation nor life everlasting except in the Catholic Church. Is there, then, no salvation outside the Church? Answer: No, there is no salvation outside the Church. Hence, We teach and declare that, by the appointment of Our Lord, the Roman Church possesses a sovereignty... to which everyone of whatsoever rite and dignity, both pastors and faithful, both individually and collectively, are bound to submit ...so that the Church of Christ may be one flock under one supreme pastor, through the preservation of unity, both of communion and of profession of the same faith, with the Roman Pontiff. This is the teaching of Catholic truth from which no one can deviate without loss of faith and salvation. Q. Why is the Church of Christ said to be the "way" or "necessary means" to salvation? A. Because Jesus Christ instituted the Church so that in her and by her the fruits of redemption might be applied to men. Not all men are saved, but only those who make use of the means provided by our Redeemer for communicating to us the merits of His passion and death. Hence, none of those who are outside can obtain eternal salvation: Outside the Church, no salvation. The Church is holy because she is united to Christ the Lord, the fountain of all holiness ... Moreover, the Church alone has the legitimate worship of sacrifice and the salutary use of the Sacraments, which are the efficacious instruments of divine grace used by God to produce true holiness. Hence, to possess true holiness, we must belong to this Church ... All who desire eternal salvation must cling to her and embrace her, like those who entered the Ark to escape perishing in the Flood. Outside the Church, no one can attain grace. He is the Lord of lords and King of kings and they who are with Him are called, and chosen, and faithful. You are the body of Christ, and members of member ... For in one Spirit we were all baptized into one body. The most Holy Roman Church firmly believes, professes, and proclaims that those not living within the Catholic Church: not only pagans, but also Jews and Heretics and Schismatics, cannot become participants in eternal life, but will depart into everlasting fire which was prepared for the devil and his angels. That faith ... is necessary to salvation, no man can reason doubt ... When God commands us to believe, He does propose that we search into His Divine judgments nor inquire into their reason and cause, but He demands an unchangeable faith by which the mind rests content in the knowledge of eternal truth ... This knowledge is nothing else than faith, by which we yield our unhesitating assent to whatever our Holy Mother the Church teaches us. Since without faith it is impossible to please God, no one is justified without it, nor will anyone attain eternal life unless he perseveres to the end in it ... All those things are to be believed by Divine and Catholic faith which are contained in the written word of God or in Tradition, and which are proposed by the Church either in solemn judgment or in its ordinary and universal teaching office as divinely revealed truths which must be believed. Without our Catholic faith, it is impossible to please God. The first condition for salvation is to keep the rule of the true faith. For we who have believed shall enter into rest ...and they to whom it was first preached did not enter because of unbelief. Now this is eternal life: that they may know Thee, the only true God, and Jesus Christ Whom Thou hast sent. Since without faith it is impossible to please God and to attain to the fellowship of His children, therefore without faith no one has ever achieved justification. No one has ever been justified without the faith. But knowing that man is not justified by the works of the law, but by the faith of Jesus Christ, we also believe in Christ so that we may be justified by the faith of Christ, and not by the works of the law: because by the works of the law no flesh shall be justified. Everyone, therefore, who shall confess Me before men, will I also confess before My Father Who is in Heaven. But he who shall deny Me before men, him will I also deny before My Father Who is in Heaven. Can we be saved in every religion? No; we can be saved only in the religion that Jesus Christ has taught. Where do we find this religion of Jesus Christ? We find it in the Roman Catholic Church. For the time is, that judgment should begin at the House of God. And if first with us, what shall be the end of those who do not believe the Gospel of God? Faith is the beginning of human salvation, the foundation and root of all justification. Whoever wishes to be saved must, above all, keep the Catholic faith; for, unless a person keeps this faith whole and entire, he will undoubtedly be lost forever ...T his is the Catholic faith: everyone must believe it, firmly and steadfastly, otherwise he cannot be saved. As many as were ordained to everlasting life believed. Q. What is primarily necessary for us if we would attain eternal life? A. To attain eternal life, it is first of all necessary for us to believe those truths which God has revealed and which the Church proposes for our belief. A. Faith is a supernatural theological virtue whereby we believe that what God has revealed and taught us through the Church is true, because of the authority of God Who reveals it, for He can neither deceive nor be deceived. Q. Are the theological virtues necessary for salvation? A. The theological virtues are absolutely necessary for salvation, for without them the right direction of mind and will towards our supernatural goal is impossible. O earth, earth, earth! Hear the word of the Lord! Constantly hold and profess this true Catholic faith, without which no one can be saved. This true Catholic faith, outside of which no one can be saved, which I now freely profess and truly hold, I do promise and swear that I will most constantly keep and confess whole and inviolate with the help of God until the last breath of my life, and that I will take great care that it will be held, taught, and preached by my inferiors and by those who will be placed under my charge. So help me God and these God's holy Gospels! Whoever wishes to be saved must, above all, keep the Catholic faith; for, unless a person keeps this faith whole and entire, he will undoubtedly be lost forever ... This is the Catholic faith: everyone must believe it, firmly and steadfastly, otherwise he cannot be saved. Take heed to thyself and to doctrine: be earnest in them. For in doing this thou shalt save both thyself and those who hear thee. Every heresy is to be anathematized. The unbelieving will have their portion in the pool burning with fire and brimstone. The branches were broken off ...Because of unbelief they were broken off. He who believes and is baptized shall be saved, but he who does not believe shall be condemned. He who does not believe shall be condemned. If anyone does not profess, in accordance with the Holy Fathers, properly and truthfully all that has been handed down and taught publicly to the Holy, Catholic, and Apostolic Church of God, both by the same Holy Fathers and by the approved universal Councils, to the last detail in word and intention: let him be anathema. If anyone rejects all Church tradition, either written or unwritten: let him be anathema. If anyone does not properly and truly confess in word and in mind according to the holy Fathers all, even to the last portion, that has been handed down and preached in the Holy, Catholic, and Apostolic Church of God, and handed down and preached likewise by the holy Fathers and the five venerable Ecumenical Councils, let him be anathema. For if you do not believe that I am He, you shall die in your sin. Let him anathema who does not believe! Take heed, brethren, lest perhaps there be in any of you an evil heart of unbelief, to depart from the living God ... And to whom did He swear, that they would not enter into His rest but to those who were incredulous? And we see that they could not enter in because of unbelief. To those who are outside, all things are done in parables; that seeing they may see and not perceive; and hearing they may hear and not understand: lest at any time they should be converted and their sins should be forgiven them. Why is the gift of faith the greatest grace of God? Because, without supernatural faith, one can do absolutely nothing towards salvation; moreover, Heaven is lost unless one receives the gift of faith from God before death. Let no man deceive you with vain words. For the anger of God cometh upon the children of unbelief because of these things. Why is the gift of faith the greatest grace of God? Because, without supernatural faith, one can do absolutely nothing towards salvation; moreover, Heaven is lost unless one re- ceives the gift of faith from God before death. Basing itself on Holy Scripture and Tradition, this Sacred Council tegches that the Church now sojourning on earth as an exile is necessary for salvation. In explicit terms, Christ affirmed the necessity of Baptism and thereby also affirmed the necessity of the Church, for through Baptism as through a door men enter the Church. Christ, present to us in His Body, which is the Church, is the sole Mediator and the exclusive way of salvation.